Sports Car Advisors | The Automobile Enthusiast Magazine | Vintage & Collector Cars, Car Shows, Motorsports Events » Blog Archive » Put on Your Rain Tires – and Drive! During Labor Day weekend 2008 I was instructing for Ferrari at Watkins Glen Raceway, in upstate New York. Early that Friday morning it was raining, a steady drizzle, with occasional bursts. When they gave the go ahead for Red Run Group to go out on the track, I suited up, drove out of the pits, onto the main track and up The Esses (the uphill, high speed curves). As I made my way around the track in the rain (wipers going…) – I made eye contact with every flagger at every flag station. Those men and women are watching every move I make, and they can save me from a bad situation with their expert flagging experience. Lap after lap (wipers going…), I incremented speeds in certain sections, driving the car “off line”, around standing water puddles, because the normal racing line looked too slick or had running water. 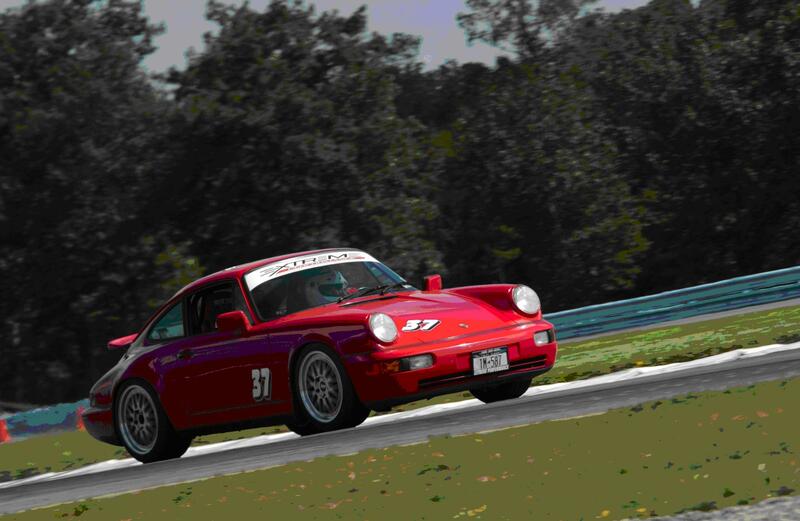 I had done five laps (wipers going…), in my bright red Porsche 911. Incrementing speeds where I could, I was going up to 100 mph at the short stretch coming up from Turn 7 to Turn 8. In the front straight, I was shifting up to 4th gear and running up to 110mph. Going down the back straight I was hitting consistently 120mph (wipers going…) in the rain. My driving was a picture of exquisite concentration and silky smooth inputs – acceleration / deceleration, transition from right to left, in soft, subtle, maneuvers; my hands hardly moved, my pedal work was pillow soft – to prevent upsetting the chassis, keeping the car moving swiftly but safely. After the chicane, racing downhill and turning right into “The Chute”, then left into “The Laces” (an altitude drop of 11 stories), I braked for the very tight right hander, known as The Toe of the Boot, which ironically is the slowest point on the track. Having completed my braking, heel-and-toe and downshifting to third gear, I cleared the apex on my right and slowly applied gas to go up the hill. But it must have been too much gas where the rain water drained from left to right; the track condition had changed since my previous lap. The back end of my car came to my left, I steered left to catch it, then it swung right, and I countered, then it swung wildly left again and turned me completely around so I was going up the hill backwards! Both feet in (on clutch and brake) I was all locked up sliding backwards – uphill. In what appears like a slow motion movie, I was looking out my left (driver’s side) window at the blue steel wall going by, only a few feet from my door handle. The front left tire then touched the grassy edge, lost all traction, whacked the Armco with the front left fender and then bounced back to hit the left rear corner. My car quickly came to rest on the grass, facing downhill. I found myself looking down the hill (wipers going…) at the flagging station I had just passed, about 50 yards away. I stretched out my arms, like a big T, to signal to the flagger: “I’m okay. Send the Tow Truck”. The left front fender was bashed and the left tail light was broken, but my car was drivable, so I drove it up onto my trailer and towed it home. The next morning I drove my Jeep back to the track to be there among the drivers and Ferraris, and help with on-track instruction. Chatting up the racers on Saturday and Sunday, I found the racing camp is still divided. There are those who insist that I was a fool to go out in the rain. But it was my first shunt at the track after driving for 16 years, and there were others who said, with a grin, “You’ve graduated!” to the society of those who have crashed at the track. Despite the controversy, I’m a firm believer that you become a better driver – in the rain. By the way, there were several Ferraris that crashed that weekend at the Glen. All those other accidents happened under perfect track conditions and sunny skies – except one (wipers going…). What’s the lesson here? What does this have to do with career decisions? Each of us, in a free nation such as we enjoy, have a multitude of opportunities in our career choices. Using discernment to make reasoned judgments among the opportunities is critical. Making informed decisions is vital. But once in a while, you just gotta put on your rain tires – and drive! Luis Martinez is an avid sports car racer, sports car driving instructor, Kung Fu practitioner, triathlete and writer. He was a Human Resources Consultant in Xerox, Corp., where he directed a global HR team for Xerox Worldwide Manufacturing. Born and raised in Havana, Cuba, Luis earned a B.A. in Psychology and M.Ed. in Counseling from the University of Delaware. He also earned certification as a Senior Professional in Human Resources (SPHR) and as a Certified Compensation Professional (CCP). He recently authored and published a book, Getting There. Luis lives with his family in Pittsford, New York. Posted on Wednesday, January 28th, 2009 at 10:42 pm	under Driving and Track Days, Sports Car Advice. Follow responses through the RSS 2.0 feed. I enjoyed the story by Mr Martinez regarding his theory about driving in the rain. I agree with him and would add that when I was in college in the 69 through 72 in New Hamphire, I competed in icekhanas on large Lakes throughout the state. Driving a new Triumph TR 6 I competed in the studless class. The events gave invaluable training that helped on dry and wet track days later when I bought my first 911 in 1973. My first day on a lake was interesting, i got the TR 6 up to about 55mph on one of the straights only to find there was a right hander coming up quickly, I rapidly went past the rt hander and had to drive back to the course and continue at a more appropriate pace.